Discover how grunge transitions can add a edgy style to your next project! In this post, we review the gritty Alpha Grunge Transitions from Luca Visual FX and giveaway transition packs to 5 lucky blog readers. YouTube introduces 3D conversions of their high resolution 2D videos. So, will YouTube's 3D technology be adopted by users? Is it really necessary? Looking for freelance video editing jobs? 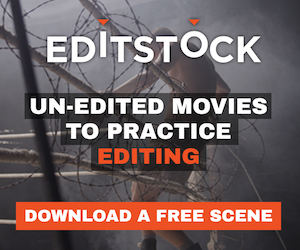 We've rounded up the best online resources for finding post-production work and making industry connections! Deciding on the appropriate background music for videos can be as confusing as choosing between off-the-wall ice cream flavors. In this post we'll take a look at what you need to consider when picking royalty-free music. Creating a dynamic and visually engaging slideshow in Final Cut Pro X doesn't have to be a painful process! Learn how you can use the app's built-in tools to quickly create a video slideshow in FCPX. New software Highlight Hunter claims to speed up your video editing by 80 percent by filtering out good shots from the bad, but is this video editing application really useful for the professional editor? Digital Rebellion's "Cut Notes" application now supports timecode markers for Final Cut Pro X. Learn how this iPad app can help streamline your video editing workflow.